The multiple-satellite data and the global–chemistry–climate model experiments with SO2 emissions enhanced by 48 % over South Asia show sulfate aerosols increase loading of 10–33 % in the UTLS over South Asia. It leads to warming in the lowermost stratosphere and direct radiative forcing at the TOA ~ −0.2 to −1.5 W m−2 over north-India during the monsoon season. The decrease in vertical velocity and enhanced stability of the upper-troposphere may lead to a weakening of the South Asian monsoon. New parameterizations for the sea spray aerosol source flux and its organic fraction were incorporated into a global aerosol-climate model. The emissions of sea salt were considerably less than previous estimates. This study demonstrates that sea spray aerosol may actually decrease the number of cloud droplets, which has a warming effect on climate. Overall, sea spray aerosol was predicted to have a global cooling effect due to the scattering of solar radiation from sea spray aerosol particles. 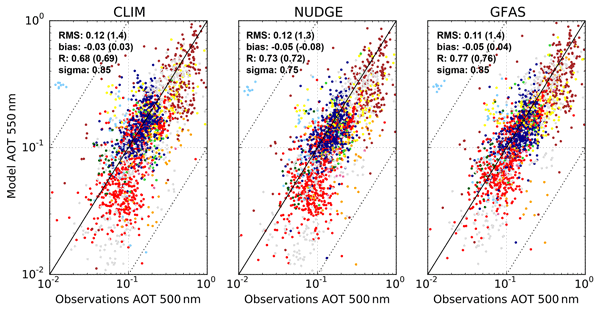 We describe a new version of the aerosol–climate model ECHAM–HAM and show tests of the model performance by comparing different aspects of the aerosol distribution with different datasets. The updated version of HAM contains improved descriptions of aerosol processes, including updated emission fields and cloud processes. While there are regional deviations between the model and observations, the model performs well overall. The global aerosol-climate model ECHAM6.3-HAM2.3 and the previous model versions ECHAM5.5-HAM2.0 and ECHAM6.1-HAM2.2 are evaluated. The simulation of clouds has improved in ECHAM6.3-HAM2.3. This has an impact on effective radiative forcing due to aerosol-radiation and aerosol-cloud interactions and equilibrium climate sensitivity which both are weaker in ECHAM6.3-HAM2.3 than in the previous model versions. Aerosol processes are a key mechanism in the development of fog. Poor representation of aerosol–fog interaction can result in large biases in fog forecasts, such as surface temperatures which are too high and fog which is too deep and long lived. A relatively simple representation of aerosol–fog interaction can actually lead to significant improvements in forecasting. Aerosol–fog interaction can have a large effect on the climate system but is poorly represented in climate models. 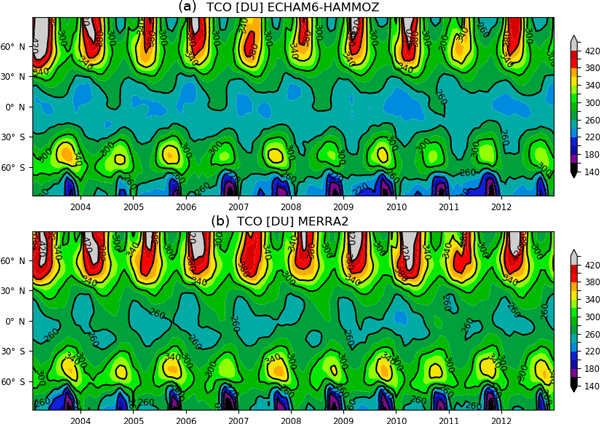 The chemistry–climate model ECHAM-HAMMOZ contains a detailed representation of tropospheric and stratospheric reactive chemistry and state-of-the-art parameterizations of aerosols. It thus allows for detailed investigations of chemical processes in the climate system. Evaluation of the model with various observational data yields good results, but the model has a tendency to produce too much OH in the tropics. This highlights the important interplay between atmospheric chemistry and dynamics. The injection of sulfur dioxide is considered as an option for solar radiation management. 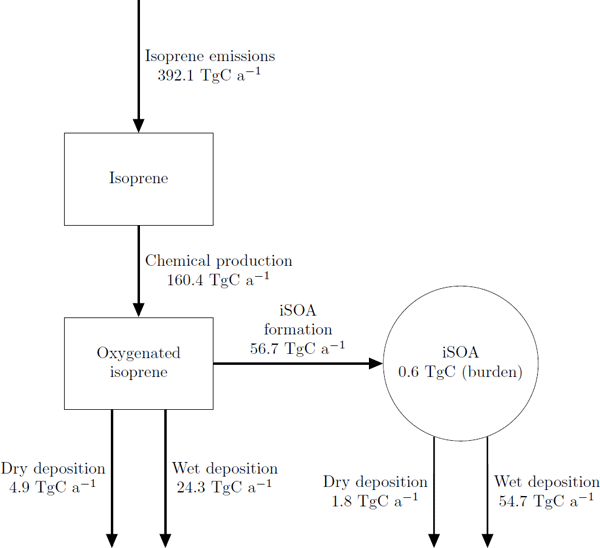 We have calculated the effects of SO2 injections up to 100 Tg(S)/y. Our calculations show that the forcing efficiency of the injection decays exponentially. This result implies that SO2 injections in the order of 6 times Mt. Pinatubo eruptions per year are required to keep temperatures constant at that anticipated for 2020, whilst maintaining business as usual emission conditions. We have showed that a coupled modelling system is beneficial in the sense that more complex processes can be included to better represent the aerosol processes starting from their formation, their interactions with clouds and provide better estimate of radiative forcing. Using this model set up, we estimated an annual mean 'indirect' radiative forcing of -0.64W/m2. This means that aerosols, solely by their capability of altering the microphysical properties of clouds can cool the Earth system. 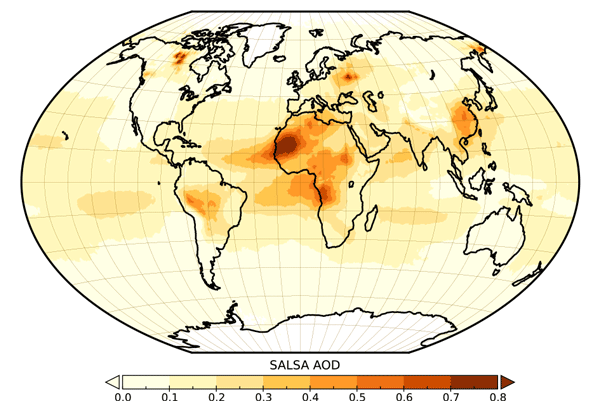 The global aerosol--climate model ECHAM-HAMMOZ is used to study the aerosol burden and forcing changes in the coming decades. We show that aerosol burdens overall can have a decreasing trend leading to reductions in the direct aerosol effect being globally 0.06--0.4W/m2 by 2030, whereas the aerosol indirect radiative effect could decline 0.25--0.82W/m2. We also show that the targeted emission reduction measures can be a much better choice for the climate than overall high reductions globally. We have integrated the sectional aerosol dynamics model SALSA into the European scale chemistry-transport model MATCH. The combined model reproduces observed higher particle number concentration (PNCs) in central Europe and lower concentrations in remote regions; however, the total PNC is underestimated. The low nucleation rate coefficient used in this study is an important reason for the underestimation. 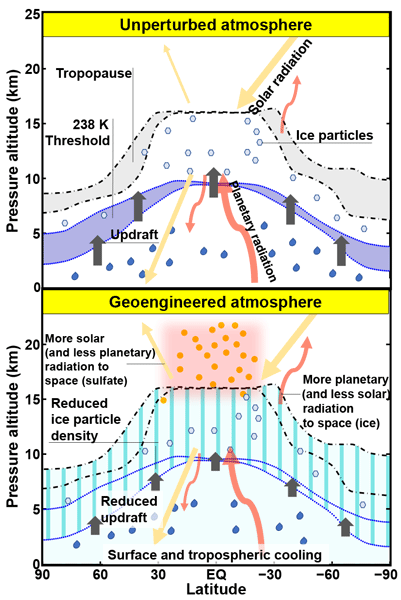 A new Geoengineering Model Intercomparison Project (GeoMIP) experiment “G4 specified stratospheric aerosols” (G4SSA) is proposed to investigate the impact of stratospheric aerosol geoengineering on atmosphere, chemistry, dynamics, climate, and the environment. In contrast to the earlier G4 GeoMIP experiment, which requires an emission of sulfur dioxide (SO2) into the model, a prescribed aerosol forcing file is provided to the community, to be consistently applied to future model experiments. Marine clouds have a strong effect on the Earth's radiative balance. One proposed climate feedback is that, in a warming climate, marine aerosol emissions will change due to changing wind speeds. We have examined the processes that affect aerosol emissions and removal over 15 years, and high-temporal-resolution output over 2 months. We conclude that wind trends are unlikely to cause a strong feedback in marine regions, but changes in removal processes or transport from continental regions may. Earth system model simulations are used to investigate the impact of volcanic aerosol forcing on stratospheric dynamics, e.g. the Northern Hemisphere (NH) polar vortex. We find that mechanisms linking aerosol heating and high-latitude dynamics are not as direct as often assumed; high-latitude effects result from changes in stratospheric circulation and related vertical motions. The simulated responses also show evidence of being sensitive to the structure of the volcanic forcing used. We apply a global 3-D climate model to quantify the climate impacts of carbonaceous aerosols from solid fuel cookstove emissions. 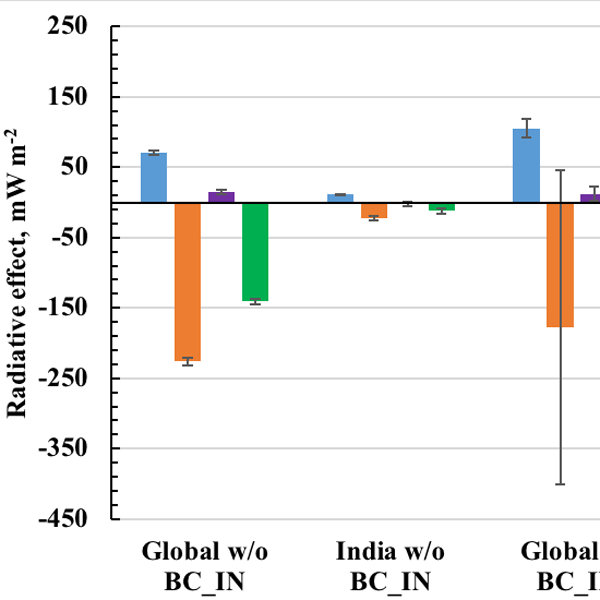 Without black carbon (BC) serving as ice nuclei (IN), global and Indian solid fuel cookstove aerosol emissions have net global cooling impacts. However, when BC acts as IN, the net sign of radiative impacts of carbonaceous aerosols from solid fuel cookstove emissions varies with the choice of maximum freezing efficiency of BC during ice cloud formation. We quantify the chemical and microphysical effects of volcanic SO2 and HCl from the June 2009 Sarychev Peak eruption using a comprehensive aerosol–chemistry model combined with in situ measurements and satellite retrievals. Our results suggest that previous studies underestimated the eruption's atmospheric and climatic impact, mainly because previous model-to-satellite comparisons had to make assumptions about the aerosol size distribution and were based on biased satellite retrievals of AOD. This study is focused on the Sarychev eruption in 2009. Based on Lagrangian model simulations and satellite data, the equatorward transport of the plume and aerosol from the Sarychev eruption is confirmed, and the transport is facilitated by the Asian summer monsoon anticyclonic circulations. The aerosol transported to the tropics remained for months and dispersed upward, which could make the Sarychev eruption have a similar global climate impact as a tropical volcanic eruption. Recent research has analyzed the formation of a particle (CN) layer in the stratosphere above Antarctica after sunrise. We investigate the CN layer formation processes with our particle formation model and derive sulfuric acid profiles (no measurements exist). Our study confirms existing explanations and gives more insights into the formation process, leading to higher derived concentrations. Therefore, this paper improves our understanding of the processes in the high atmosphere. Could aerosol emissions be used for regional heat wave mitigation? Ansmann, A., Mattis, I., Wandinger, U., Wagner, F., Reichardt, J., and Deshler, T.: Evolution of the pinatubo aerosol: raman lidar observations of particle optical depth, effective radius, mass, and surface area over central europe at 53.4° N, J. Atmos. Sci., 54, 2630–2641, https://doi.org/10.1175/1520-0469(1997)054<2630:EOTPAR>2.0.CO;2, 1997. Aquila, V., Oman, L. S., Stolarski, R. S., Colarco, P. R., and Newman, P. A.: Dispersion of the volcanic sulfate cloud from a Mount Pinatubo–like eruption, J. Geophys. Res., 117, D06216, https://doi.org/10.1029/2011JD016968, 2012. Bala, G., Duffy, P. B., and Taylor, K. E.: Impact of geoengineering schemes on the global hydrological cycle, P. Natl. Acad. Sci. USA, 105, 7664–7669, https://doi.org/10.1073/pnas.0711648105, 2008. 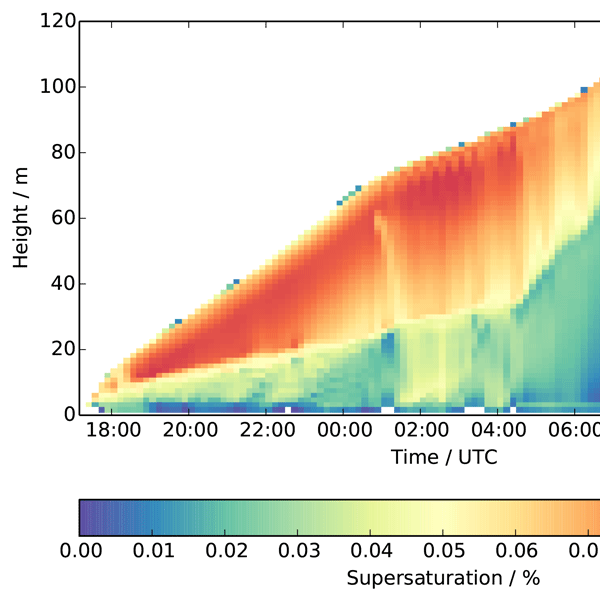 Baran, A. J. and Foot, J. S.: New application of the operational sounder HIRS in determining a climatology of sulphuric acid aerosol from the Pinatubo eruption, J. Geophys. Res.-Atmos., 99, 25673–25679, 1994. Crutzen, P. J.: Albedo enhancement by stratospheric sulphur injections: A contribution to resolve a policy dilemma?, Climatic Change, 77, 211–219, 2006. Dentener, F., Kinne, S., Bond, T., Boucher, O., Cofala, J., Generoso, S., Ginoux, P., Gong, S., Hoelzemann, J. J., Ito, A., Marelli, L., Penner, J. E., Putaud, J.-P., Textor, C., Schulz, M., van der Werf, G. R., and Wilson, J.: Emissions of primary aerosol and precursor gases in the years 2000 and 1750 prescribed data-sets for AeroCom, Atmos. Chem. Phys., 6, 4321–4344, https://doi.org/10.5194/acp-6-4321-2006, 2006. Dhomse, S. S., Emmerson, K. M., Mann, G. W., Bellouin, N., Carslaw, K. S., Chipperfield, M. P., Hommel, R., Abraham, N. L., Telford, P., Braesicke, P., Dalvi, M., Johnson, C. E., O'Connor, F., Morgenstern, O., Pyle, J. A., Deshler, T., Zawodny, J. M., and Thomason, L. W.: Aerosol microphysics simulations of the Mt. Pinatubo eruption with the UM-UKCA composition-climate model, Atmos. Chem. Phys., 14, 11221–11246, https://doi.org/10.5194/acp-14-11221-2014, 2014. Driscoll, S., Bozzo, A., Gray, L. J., Robock, A., and Stenchikov, G.: Coupled Model Intercomparison Project 5 (CMIP5) simulations of climate following volcanic eruptions, J. Geophys. Res., 117, D17105, https://doi.org/10.1029/2012JD017607, 2012. English, J. M., Toon, O. J., and Mills, M. J.: Microphysical simulations of large volcanic eruptions: Pinatubo and Toba, J. Geophys. Res.-Atmos., 118, 1880–1895, https://doi.org/10.1002/jgrd.50196, 2013. Ferraro, A. J., Highwood, E. J., and Charlton-Perez, A. J.: Weakened tropical circulation and reduced precipitation in response to geoengineering, Environ. Res. Lett., 9, 014001, https://doi.org/10.1088/1748-9326/9/1/014001, 2014. Fischer, E., Luterbacher, J., Zorita, E., Tett, S. F. B., Casty, C., and Wanner, H.: European climate response to tropical volcanic eruptions over the last half millennium, Geophys. Res. Lett., 34, L05707, https://doi.org/10.1029/2006GL027992, 2007. 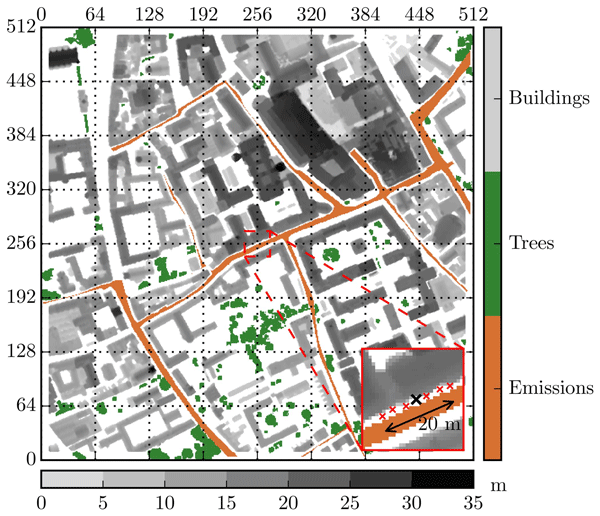 Fuglestvedt, J. S., Samset, B. J., and Shine, K. P.: Counteracting the climate effects of volcanic eruptions using short-lived greenhouse gases, Geophys. Res. Lett., 41, 8627–8635, https://doi.org/10.1002/2014GL061886, 2014. 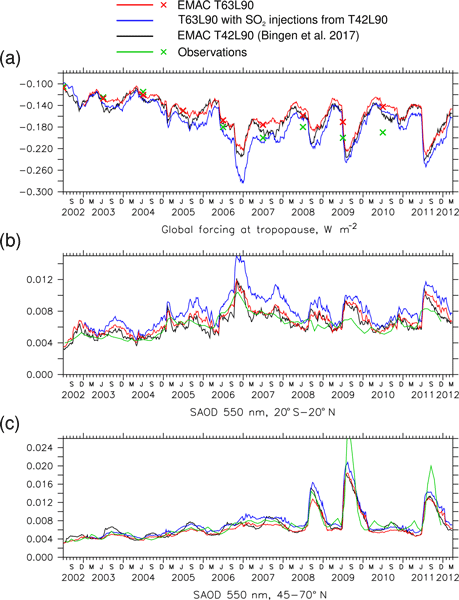 Giorgetta, M. A., Manzini, E., Roeckner, E., Esch, M., and Bengtsson, L.: Climatology and forcing of the quasi-biennial oscillation in the MAECHAM5 model, J. Climate, 19, 3882–3901, 2006. Giorgetta, M. A., Jungclaus, J., Reick, C. H., Legutke, S., Bader, J., Böttinger, M., Brovkin, V.,Crueger, T., Esch, M., Fieg, K., Glushak, K., Gayler, V., Haak, H., Hollweg, H.-D., Ilyina, T.,Kinne, S., Kornblueh, L., Matei, D., Mauritsen, T., Mikolajewicz, U., Mueller, W., Notz, D., F., Raddatz, T., Rast, S., Redler, R., Roeckner, E., Schmidt, H., Schnur, R., Segschneider, J., Six, K. D., Stockhause, M., Timmreck, C., Wegner, J., Widmann, H., Wieners, K.-H., Claussen, M., Marotzke, J., and Stevens, B.:Climate and carbon cycle changes from 1850 to 2100 in MPI-ESM simulations for the coupled model intercomparison project phase 5, J. Adv. Model. Earth Syst., 5, 572–597, https://doi.org/10.1002/jame.20038, 2013. Guo, S., Rose, W. I., Bluth, G. J. S., and Watson, I. M.: Particles in the great Pinatubo volcanic cloud of June 1991: The role of ice, Geochem. Geophy. Geosy., 5, Q05003, https://doi.org/10.1029/2003GC000655, 2004a. Guo, S., Bluth, G. J. S., Rose, W. I., Watson, I. M., and Prata, A. J.: Re-evaluation of SO2 release of the 15 June 1991 Pinatubo eruption using ultraviolet and infrared satellite sensors, Geochem. Geophy. Geosy., 5, Q04001, https://doi.org/10.1029/2003GC000654, 2004b. Hansen, J., Lacis, A., Ruedy, R., and Sato, M.: Potential climate impact of Mount-Pinatubo eruption, Geophys. Res. Lett., 19, 215–218, https://doi.org/10.1029/91GL02788, 1992. Heckendorn, P., Weisenstein, D., Fueglistaler, S., Luo, B. P., Rozanov, E., Schraner, M., Thomason, L. W., and Peter, T.: The impact of geoengineering aerosols on stratospheric temperature and ozone, Environ. Res. Lett. 4, 045108, https://doi.org/10.1088/1748-9326/4/4/045108, 2009. Ilyina, T., Six, K. D., Segschneider, J., Maier-Reimer, E., Li, H., and Nunez-Riboni, I.: Global ocean biogeochemistry model HAMOCC: Model architecture and performance as component of the MPI-Earth System Model in different CMIP5 experimental realizations, J. Adv. Model. Earth Syst., 5, 287–315, https://doi.org/10.1029/2012MS000178, 2013. IPCC: Climate Change 2013: The Physical Science Basis. Contribution of Working Group I to the Fifth Assessment Report of the Intergovernmental Panel on Climate Change, edited by: Stocker, T. F., Qin, D., Plattner, G.-K., Tignor, M., Allen, S. K., Boschung, J., Nauels, A., Xia, Y., Bex, V., and Midgley, P. M., Cambridge University Press, Cambridge, UK and New York, NY, USA, 1535 pp., https://doi.org/10.1017/CBO9781107415324, 2013. 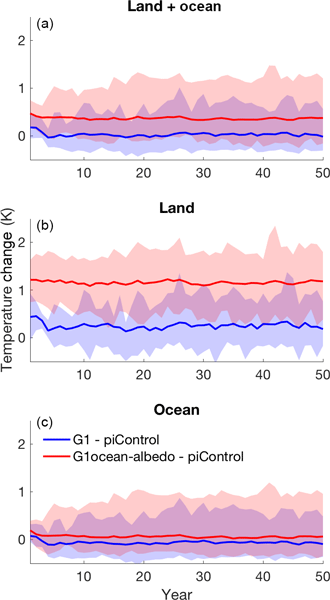 Jungclaus, J. H., Fischer, N., Haak, H., Lohmann, K., Marotzke, J., Matei, D., Mikolajewicz, U., Notz, D., and von Storch, J.-S.: Characteristics of the ocean simulations in MPIOM, the ocean component of the MPI Earth System Model, J. Adv. Model. Earth Syst., 5, 422–446, https://doi.org/10.1002/jame.20023, 2013. Keith, D. W. and MacMartin, D. G.: A temporary, moderate and responsive scenario for solar geoengineering, Nature Clim. Change, 5, 201–206, https://doi.org/10.1038/NCLIMATE2493, 2015. Kinne, S., O'Donnell, D., Stier, P., Kloster, S., Zhang, K., Schmidt, H., Rast, S., Giorgetta, M., Eck, T. F., and Stevens, B.: MAC-v1: A new global aerosol climatology for climate studies, J. Adv. Model. Earth Syst., 5, 704–740, https://doi.org/10.1002/jame.20035, 2013. Kokkola, H., Korhonen, H., Lehtinen, K. E. J., Makkonen, R., Asmi, A., Järvenoja, S., Anttila, T., Partanen, A.-I., Kulmala, M., Järvinen, H., Laaksonen, A., and Kerminen, V.-M.: SALSA – a Sectional Aerosol module for Large Scale Applications, Atmos. Chem. Phys., 8, 2469–2483, https://doi.org/10.5194/acp-8-2469-2008, 2008. 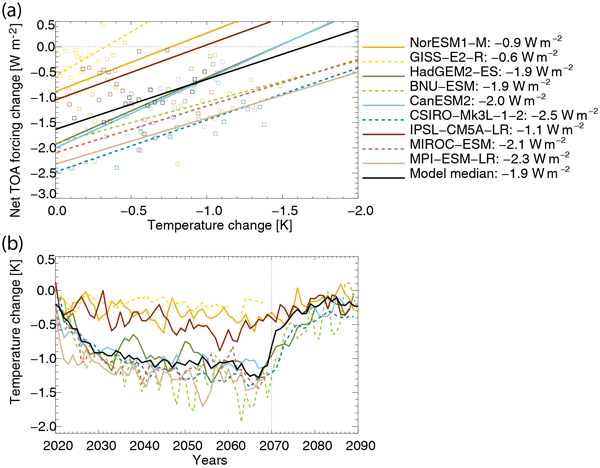 Kokkola, H., Hommel, R., Kazil, J., Niemeier, U., Partanen, A.-I., Feichter, J., and Timmreck, C.: Aerosol microphysics modules in the framework of the ECHAM5 climate model – intercomparison under stratospheric conditions, Geosci. Model Dev., 2, 97–112, https://doi.org/10.5194/gmd-2-97-2009, 2009. Kravitz, B., Caldeira, K., Boucher, O., Robock, A., Rasch, P. J., Alterskjær, K., Karam, D., B., Cole, J. N. S., Curry, C. L., Haywood, J. M., Irvine, P. J., Ji, D., Jones, A., Kristjánsson, J. E., Lunt, D. J., Moore, J. C., Niemeier, U., Schmidt, H., Schulz, M., Singh, B., Tilmes, S., Watanabe, S., Yang, S., and Yoon, J.-H.: Climate model response from the Geoengineering Model Intercomparison Project (GeoMIP), J. Geophys. Res.-Atmos., 118, 8320–8332, https://doi.org/10.1002/jgrd.50646, 2013a. Kravitz, B., Rasch, P. J., Forster, P. M., Andrews, T., Cole, J. N. S., Irvine, P. J., Ji, D., Kristjánsson, J. E., Moore, J. C., Muri, H., Niemeier, U., Robock, A., Singh, B., Tilmes, S., Watanabe, S., and Yoon, J.-H.: An energetic perspective on hydrological cycle changes in the Geoengineering Model Intercomparison Project, J. Geophys. Res.-Atmos., 118, 13087–13102, https://doi.org/10.1002/2013JD020502, 2013b. Laakso, A., Partanen, A.-I., Kokkola, H., Laaksonen, A., Lehtinen, K. E. J., and Korhonen, H.: Stratospheric passenger flights are likely an ineffcient geoengineering strategy, Environ. Res. Lett., 7, 034021, https://doi.org/10.1088/1748-9326/7/3/034021, 2012. McClellan, J., Keith, D. W., and Apt, J.: Cost analysis of stratospheric albedo modification delivery systems, Environ. Res. Lett., 7, 034019, https://doi.org/10.1088/1748-9326/7/3/034019, 2012. Monahan, E., Spiel, D., and Davidson, K.: Oceanic whitecaps and their role in air-sea exchange, D. Reidel, Norwell, Mass., USA, 167–174, 1986. Niemeier, U., Timmreck, C., Graf, H.-F., Kinne, S., Rast, S., and Self, S.: Initial fate of fine ash and sulfur from large volcanic eruptions, Atmos. Chem. Phys., 9, 9043–9057, https://doi.org/10.5194/acp-9-9043-2009, 2009. Niemeier, U., Schmidt, H., and Timmreck, C.: The dependency of geoengineered sulfate aerosol on the emission strategy, Atmos. Sci. Lett. 12, 189–194, 2011. Niemeier, U., Schmidt, H., Alterskjær, K., and Kristjánsson, J. E.: Solar irradiance reduction via climate engineering: Impact of different techniques on the energy balance and the hydrological cycle, J. Geophys. Res., 118, 12195–12206, 2013. 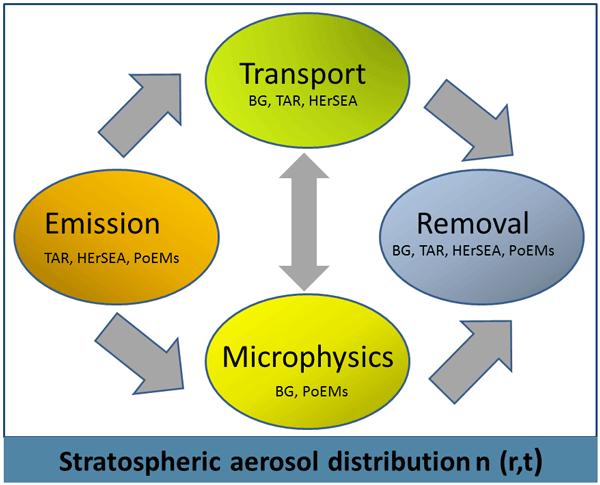 Pierce, J. R., Weisenstein, D., Heckendorn, P., Peter, T., and Keith D. W.: Efficient formation of stratospheric aerosol for climate engineering by emission of condensible vapor from aircraft, Geophys. Res. Lett., 37, L18805, https://doi.org/10.1029/2010GL043975, 2010. Rasch, P. J., Tilmes, S., Turco, R. P., Robock, A., Oman, L., Chen, C.-C., Stenchikov, G. L., and Garcia, R.: An overview of geoengineering of climate using stratospheric sulphate aerosols, Phil. T. R. Soc. A, 366, 4007–4037, 2008. Read, W. G., Froidevaux, L., and Waters, J. W.: Microwave limb sounder measurements of stratospheric SO2 from the Mt. Pinatubo volcano, Geophys. Res. Lett., 20, 1299–1302, 1993. Reick, C., Raddatz, T., Brovkin, V., and Gayler, V.: The representation of natural and anthropogenic land cover change in MPI-ESM, J. Adv. Model. Earth Syst., 5, 459–482, https://doi.org/10.1002/jame.20022, 2013. Robock, A.: Volcanic eruptions and climate, Rev. Geophys., 38, 191–219, https://doi.org/10.1029/1998RG000054, 2000. Robock, A. and Mao, J.: Winter warming from large volcanic eruptions, Geophys. Res. Lett., 19, 2405–2408, 1992. Robock, A., Marquardt, A., Kravitz, B., and Stenchikov, G.: Benefits, risks, and costs of stratospheric geoengineering, Geophys. Res. Lett., 36, L19703, https://doi.org/10.1029/2009GL039209, 2009. Schulz, M., de Leeuw, G., and Balkanski, Y.: Sea-salt aerosol source functions and emissions, in: Emission of Atmospheric Trace Compounds, Kluwer Acad., Norwell, Mass., USA, 333–359, 2004. Sheng, J.-X., Weisenstein, D. K., Luo, B.-P., Rozanov, E., Arfeuille, F., and Peter, T.: A perturbed parameter model ensemble to investigate Mt. Pinatubo's 1991 initial sulfur mass emission, Atmos. Chem. Phys., 15, 11501–11512, https://doi.org/10.5194/acp-15-11501-2015, 2015. Smith, M. and Harrison, N.: The sea spray generation function. J. Aerosol Sci., 29, 189–190, 1998. Stenchikov, G., Delworth, T. L., Ramaswamy, V., Stouffer, R. J., Wittenberg, A., and Zeng, F.: Volcanic signals in oceans, J. Geophys. Res., 114, D16104, https://doi.org/10.1029/2008JD011673, 2009. 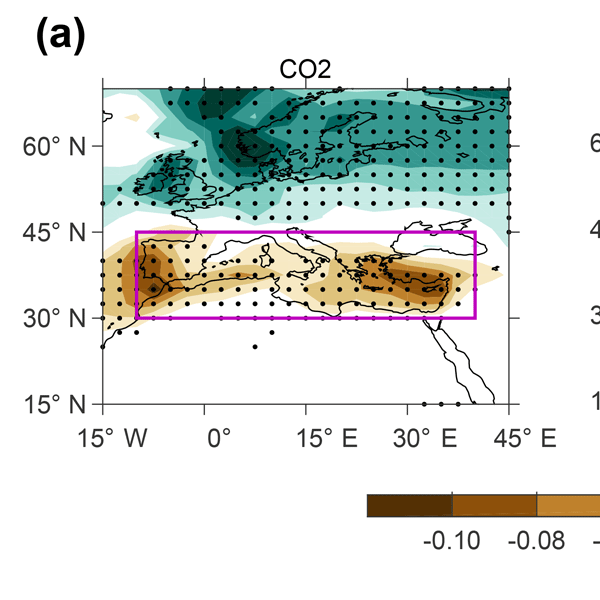 Tegen, I., Harrison, S. P., Kohfeld, K., Prentice, I. C., Coe, M., and Heimann, M.: Impact of vegetation and preferential source areas on global dust aerosol: Results from a model study, J. Geophys. Res., 107, 4576, https://doi.org/10.1029/2001JD000963, 2002. Timmreck, C.: Modeling the climatic effects of volcanic eruptions, Wiley Interdisciplinary Reviews: Climate Change, 3, 545–564, https://doi.org/10.1002/wcc.192, 2012. Timmreck, C., Graf, H.-F., and Kirchner, I.: A one and a half year interactive simulation of Mt. Pinatubo aerosol, J. Geophys. Res., 104, 9337–9360, 1999. Timmreck, C., Graf, H.-F., Lorenz, S. J., Niemeier, U., Zanchettin, D., Matei, D., Jungclaus, J. H., and Crowley T. J.: Aerosol size confines climate response to volcanic super-eruptions (2010), Geophys. Res. Lett., 37, L24705, https://doi.org/10.1029/2010GL045464, 2010. We have studied the impacts of a volcanic eruption during solar radiation management (SRM) using an aerosol-climate model ECHAM5-HAM-SALSA and an Earth system model MPI-ESM. A volcanic eruption during stratospheric sulfur geoengineering would lead to larger particles and smaller amount of new particles than if an volcano erupts in normal atmospheric conditions. Thus, volcanic eruption during SRM would lead to only a small additional cooling which would last for a significantly shorter period.